DualLiner bedliners are designed to protect your fleet and your crew’s cargo even in the most extreme uses. Whether you’re a contractor, road builder, landscaper, brick layer, mover, oil field worker, painter, drywaller or in any other field that tends to be hard on vehicles, DualLiner bedliners are up to the challenge.Each DualLiner bedliner features a hard custom-fit load guard, sidewalls and tailgate protector (on trucks without a factory tailgate step). Each of the pieces are connected with our patented interlocking “C” channel and heavy-duty 3/8” thick ZeroSkid® rubber floor, which keeps cargo in its place. We stand behind the durability of our bedliners for the life of your trucks, regardless of use or circumstance. While our competitors void warranties for commercial users, DualLiner will replace your bedliner if it breaks, cracks or fades, no matter how hard your fleet uses it. Each DualLiner bedliner features tough, custom-fit plastic sidewalls that offer maximum protection from dents and scratches. Designed to match the contours of your fleet trucks’ beds, our sidewalls absorb damage so your trucks’ beds don’t have to. DualLiner protects your trucks’ value, can easily be transferred from one truck to the next, and it’s perfect for commercial leased vehicles. 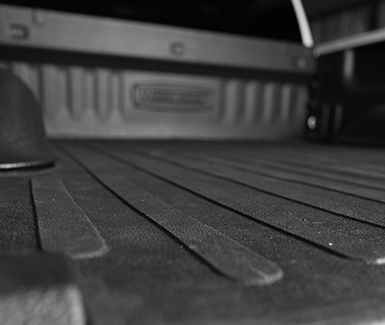 DualLiner bed liners are built for durability, sustainability and quality. They withstand the elements and continuous abuse. No need for an annual UV stabilizer or any other yearly treatments. Are you interested in other truck accessories?